MSC’s new debutante is big, beautiful, and brimming with bright ideas. At 171,598 gross tons, MSC Meraviglia is the biggest cruise ship launched this year, and the fourth largest in the world. She may not quite live up to such extravagant hype (how could she?) but during a preview weekend and christening last month, it was widely acknowledged that she’s a game-changer. In keeping with the Meraviglia theme, the decks are named after wonders of the world, ancient and modern. There’s Babylon (no hanging gardens, alas, but a ropes course and the Polar Aqua Park), plus Pyramids, Iguazu, Tour Eiffel, Angkor Wat, Kilimanjaro, Acropolis, Hagia Sophia, Alhambra, Taj Mahal, Petra and Colosseum. 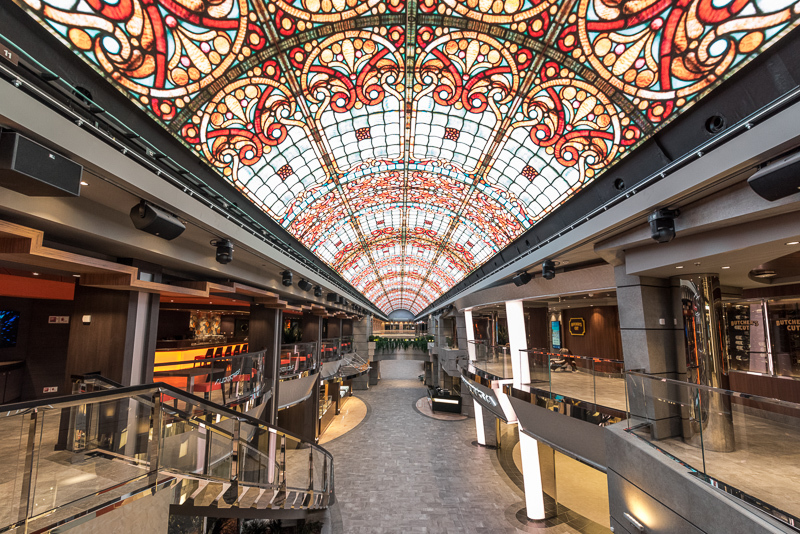 Internally, there is a dazzling, mirror-clad “Infinity Atrium”, but the most stunning feature is the Galleria Meraviglia – an idea borrowed from the Promenade shopping mall on Royal Caribbean ships but with an exceptional addition. The 263-ft long ceiling is a giant LED screen that can change at the flick of a switch from ornate stained glass to a palm-fringed beach or an aquarium. The split-level Galleria, as long as a football pitch, runs from the photo gallery aft to the Broadway Theatre forward. On the lower level are the shore excursions desk, shops, Italian restaurants, creperie and – something of a highlight – the Jean-Philip Maury chocolate shop, where a team of six craftsmen can create confectionery to your own design. The upper level incorporates a classy champagne bar, the Kaito teppanyaki and sushi restaurants, and the Brass Anchor – as close to a British pub as you’ll find at sea. Facing these is the Butcher’s Cut steakhouse, where à la carte options include a tomahawk for two at 84 and a 20-oz rib-eye at 46. Other speciality dining options include Eataly Ristorante Italiano, while on Deck 6 there are no fewer than three main restaurants – Panorama, L’Olivo d’Oro and L’Olive Dorée – catering for flexible sittings. Waves on Deck 5 offers traditional fixed sittings for dinner, and waiter-service breakfast and lunch. 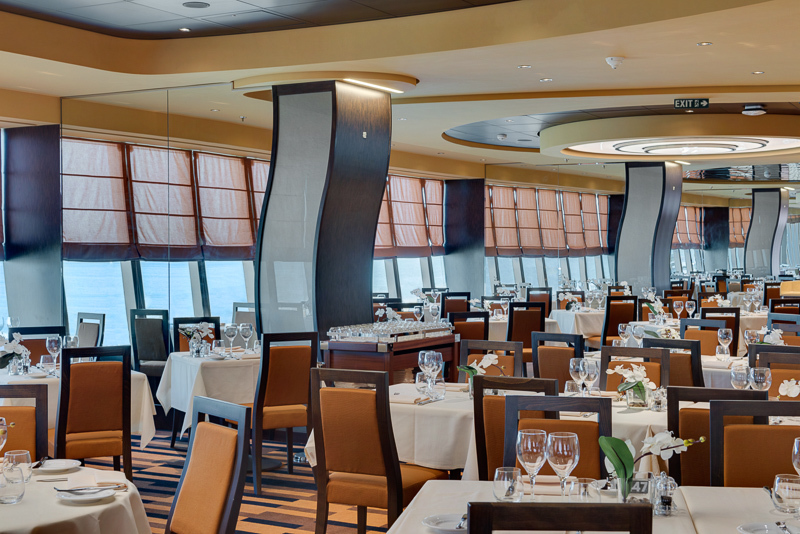 The Marketplace Buffet casual restaurant on Deck 15 seats up to 1,345 diners, with an al fresco area at the stern. Separate serveries for hot, cold and world cuisine reduce queuing, while grab-and-go pizzas, burgers and hot dogs are available at the Atmosphere Bar by the main pool. 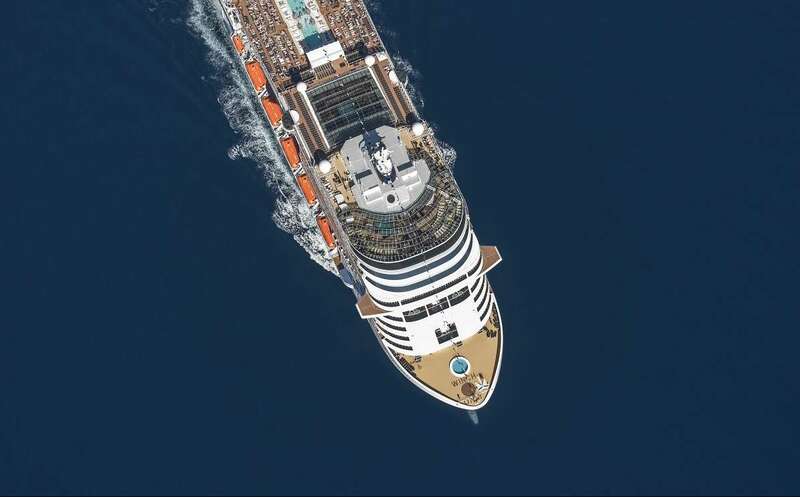 Family-owned MSC Cruises is now the fourth largest cruise operator in the world – behind Carnival, Royal Caribbean and Norwegian Cruise Line – and Meraviglia is the first of 11 new ships it plans to launch before 2026. 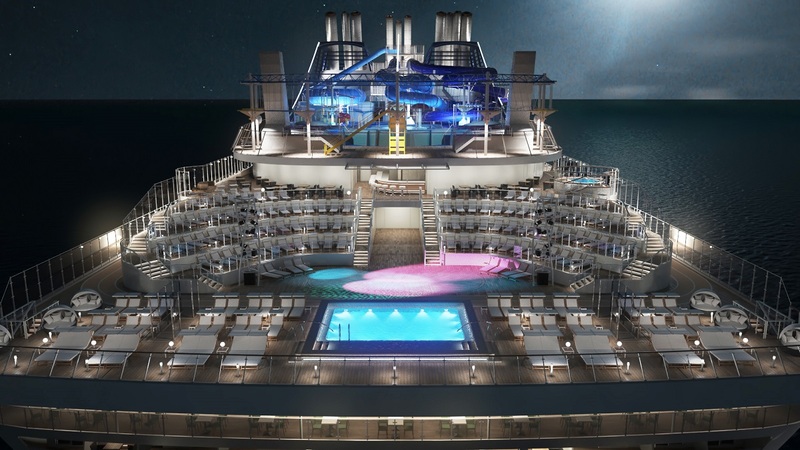 MSC Seaside will debut in December, to be followed by Seaview next year. Bellissima – sister to Meraviglia – arrives in 2019, to be followed by two Meraviglia-Plus class vessels that will include museums featuring exhibits from some of Europe’s top galleries. Finally, the new World Class – four ships being built between 2022 and 2026 – will carry more passengers than any other cruise ship yet announced. “We have an ambitious vision, and MSC Meraviglia marks the start of the second phase of our growth,” says the company’s executive chairman Pierfrancesco Vago. 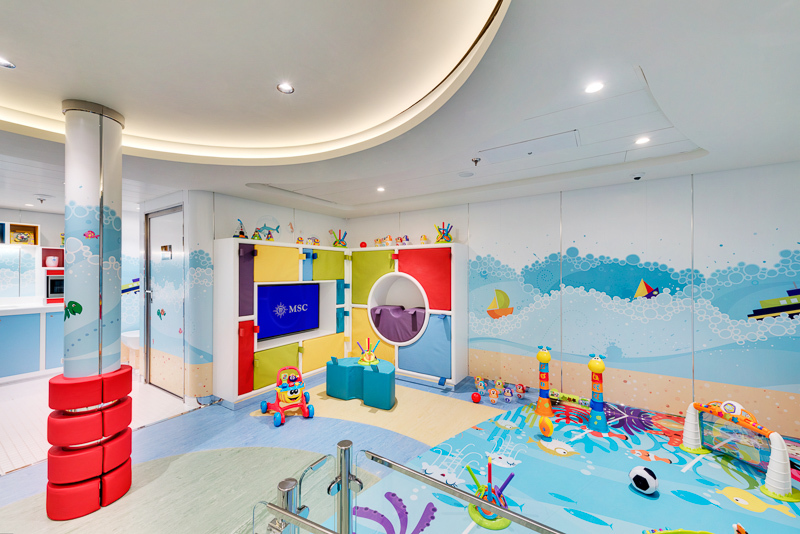 the very latest cutting-edge marine technology to create unforgettable holiday experiences at sea for guests of all ages. See opposite for our rundown of what Meraviglia has to offer – and you’ll soon agree that Mr Vago has a point. Meraviglia’s ship-within-a-ship Yacht Club is the largest in the fleet, with 95 suites on three decks, attended by 24- hour butler service. Guests have their own private restaurant and exclusive pool and solarium on the top deck. The signature Top Sail Lounge for Yacht Club guests has extensive views over the bow from Deck 16. Meraviglia’s 3,280sq ft Aurea Spa offers 20 types of massage, 20 body treatments and 30 different facials. There’s a beauty salon and a barber shop as well as a thermal area equipped with saunas, steam baths, cold rooms, a salt relax room, and aromatic showers. The gym is fitted out with Technogym cardio and strength-training equipment, with trained instructors providing fitness courses, spinning classes, Pilates and yoga. 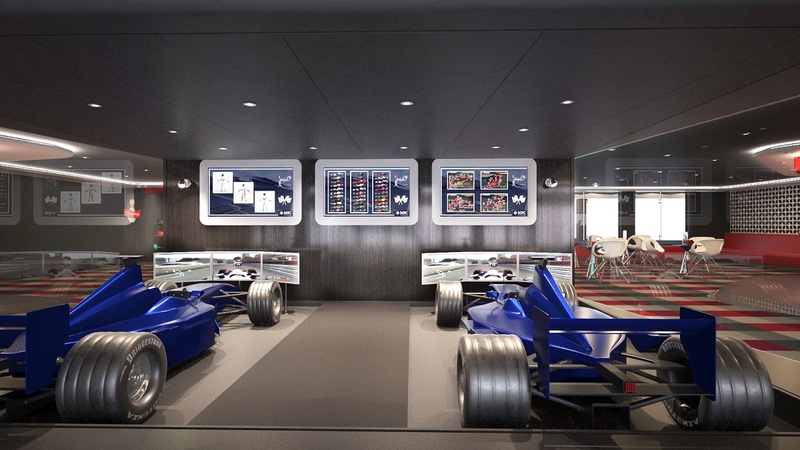 Two Formula 1 simulators allow guests to duel at the wheel. They can also shoot aliens and zombies in the 4D cinema, pilot a plane or ride a roller-coaster, all in virtual reality. Meraviglia is the first cruise ship to feature performances by the famed Cirque du Soleil. Two completely new shows have been created for Meraviglia: Sonor is an adventure in sound, while Viaggio combines poetry and colour, all with Cirque’s blend of acrobatics, dance and feats of strength. Performances take place in the Carousel Lounge, a 413-seat venue that is one of the smallest venues used by any Cirque de Soleil residence around the world, offering a unique close-up view of the performers. Meanwhile, for more traditional entertainment, the ship’s Broadway Theatre has space for 985 guests to enjoy a spectacular programme of shows. Divided into seven age groups, the children’s facilities are outstanding. A Chicco nursery provides a large sleeping room for tiny tots, and there are three separate sections devoted to LEGO modellers. In the DOREMI Lab, youngsters can try out the latest virtual reality games and 3D printers, while an interactive table in the teens’ area can be used for messaging and controlling the room’s music. Parents can keep track using an app linked to their children’s MSC for Me wristbands (these act like cruise cards, unlocking cabin doors and enabling guests to check in and out when going ashore).